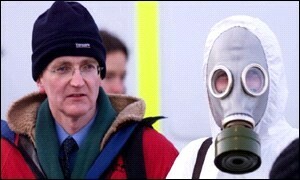 The Minister for the Environment, John Gormley (pictured above beside a man in a black hat) said he welcomed the news that he had set a record for most continuous appearances on the front page of the Irish Times for no actual reason. On hearing the news, Mr. Gormley said ‘it was a great privilege’ to have receive such gratuitous coverage since his inclusion in the new cabinet. There were chaotic scenes at the site of the M3 motorway construction near the Hill of Tara earlier this week when it’s believed that between three and seven protestors tried to prevent work on the controversial project from proceeding. Garda reinforcements were brought to the scene to ensure that passing drivers, unaware of the demonstration which was taking place nearby remained unaware of the demonstration. Spokesman for the Save Old Stones Campaign, Vincent Salafia, welcomed the attention the action had received and was also keen to stress the success of his organisation’s petition signing initiative. A document signed by more than 50,000 people protesting against the destruction of the Tara site will be presented to the Taoiseach at Leinster House following a march from Parnell Square on Saturday afternoon. ‘Yes it’s true,’ Mr. Salafia said, ‘that the vast majority of the signatures on the petition come from Germany,’ He went onto to explain that ‘Vincent Salafia’ is a very popular name in Germany which would account for the two hundred German Vincent Salafias who signed the petition. Minister for the Environment John Gormley confirmed that during his recent visit to Brussels he had given European Environment Commissioner, Stavros Dimas, every assurance that he would continue to quietly slip new European environmental directives into Irish planning law without letting the Irish people know anything about it. On the issue of the EC’s recent ruling that Irish local authorities discriminate against non locals in planning applications, the Minister gave the Commissioner his assurances that, thanks to guaranteed favourable coverage from RTE and the Irish Times, the issue would never again see the light of day. Mr. Gormley said that he welcomed Mr. Dimas’ praise for the way the Green Party had negotiated a place in government as well as two full cabinet posts despite having less than 4% of the popular vote. ‘The exploitation of the democratic deficit is what the European experiment is all about,’ Mr. Gormley said.